?????? ?3 © 1992 Namco, Limited. Released on December 8, 1992 in Japan, Wagan Land 3 is the third and final installment of the series for the Family Computer. The game's setting is changed from Wagan Land, the location in preceding installments, to a space city where the 'Hisopiso family', a distant relative of the Wagan family, lives. Because of the change of setting to space, Wagan's jumping ability is increased and there are stages where the player can walk upside down under the ceiling. This installment also introduces a 2-player versus mode where the player can control any of the boss characters. 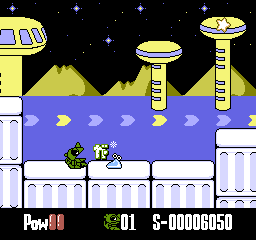 The ending of this game serves as a cliffhanger to the next installment, Super Wagan Land 2.